In late February, Jasmine was surrendered by her owners to an overcrowded shelter in Southern California. Her body bore the signs of severe over-breeding, and with her days as a perpetual puppy maker numbered, the dog was essentially discarded. When Wags and Walks Rescue founder Lesley Brog met the abandoned pit bull, she felt it was time for someone to finally take care of her. Jasmine captured Lesley’s attention in her kennel at the shelter because not only was she a beautiful girl, but her entire body wiggled with love, and her big brown eyes were soulful and loving. It was obvious this girl had tremendous love to give and was starved for affection. She had a calm energy and kept licking as best she could to kiss Lesley through the bars of her kennel. Once Lesley had Jasmine safely in her possession, she brought her to her vet’s office to be spayed. That’s when they learned that Jasmine was carrying at least seven puppies and was due any moment! (Lesley had thought her body was swollen and sagging due to her over-breeding). 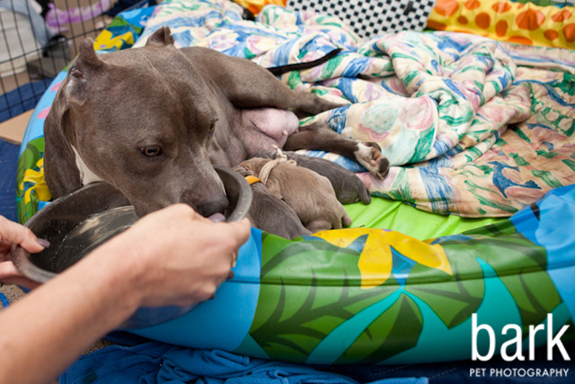 Jasmine lived harmoniously with Lesley’s two other rescued pit bulls and her two young children. In fact, Jasmine’s favorite pastime was to curl up with the children on the couch for movie night! 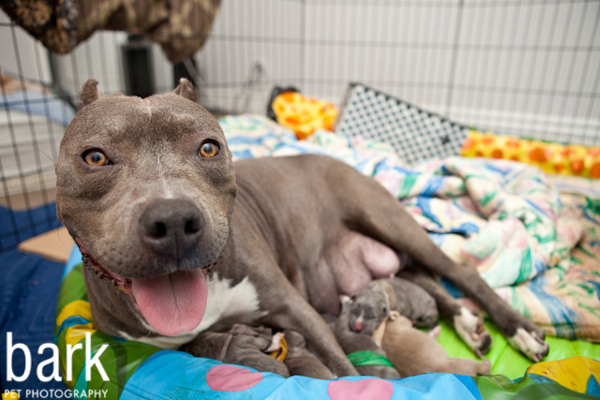 On Easter Sunday, Jasmine delivered eight beautiful, healthy puppies and to no one’s surprise is a perfect momma. She snuggles the puppies endlessly and desires to be with them every moment. Of course, she has been allowing visitors due to her sweet temperament but spends most of her time licking and kissing her babies (and sleeping)! Most puppies are mini Jasmines with blue fur and white sleeves. If they are even half as sweet as their momma they will all be great dogs. On the day we saved Jasmine, we thought we were saving one lovely life. … We are so pleased to have saved nine lovely lives that day! It’s possible this was her first litter, based on the info in the article — swollen and saggy is par for the course with any canine pregnancy, even smaller litters! What a beautiful momma! Thank you for saving her and her pups. I love the video at the end. @annedreshfield Isn’t she so sweet? What a beautiful and loving mama!! I hope she and her babies all find their forever home. I love the video! 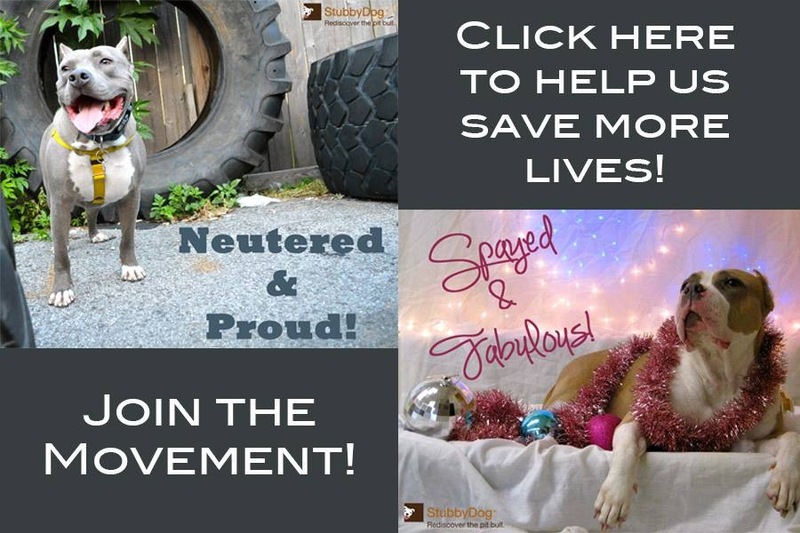 @AliciaAnthonyBaldwin Lesley reports all the pups have found their furever homes. Jasmine is still staying with Lesley. That has got to be one of the sweetest dog faces I have ever seen! Thank you for saving this beautiful mama and her pups. Awww! Thank you for saving these 9 precious lives. Jasmine looks so peaceful and happy! 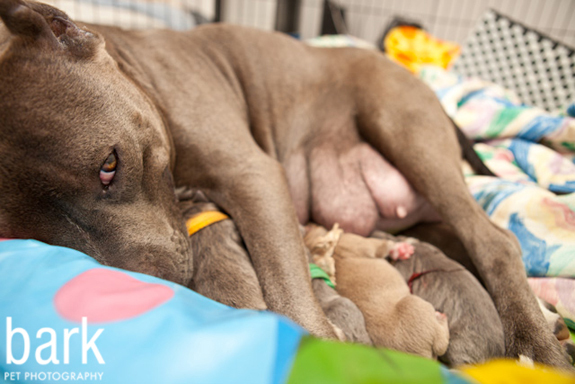 Thank you for saving her and her babies.